Do you want to know more about Vine video? Are you wondering how brands and businesses can successfully market with Vine video? 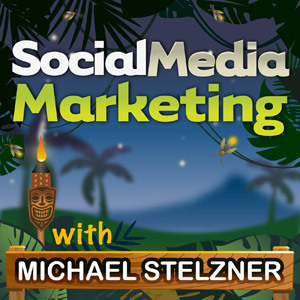 To explore how to use Vine short video on Twitter, I interview Zach King for this episode of the Social Media Marketing podcast. In this episode, I interview Twitter Vine personality and host of KingFilmSchool.com Zach King. Known as FinalCutKing on YouTube and Twitter, Zach has more than 1.6 million followers on Vine and creates short special effects videos that have been watched millions of times. Zach shares how he got started with film and online video. You’ll discover tips for shooting your own Vine video. Zach’s curiosity was piqued in September 2013 when friends started showing him Vines. He shares that he decided to try the platform for 30 days. During that time, he made a Vine a day based around silly ideas he and his roommate came up with. Each 7-second Vine featured a special effect and in 30 days, Zach says he accumulated 200,000 followers. He was hooked by the growth rate. Zach talks about why the challenge of using Vine to tell stories excites him. Listen to the show to find out how Vine works. Zach believes his Vines are successful because they include circumstances everyone can relate to. For example, almost everyone has locked the keys in the car or wanted a special souvenir from a vacation. Listen to the show to hear about more of Zach’s successful videos. Zach shares that as he was working his way through film school by teaching FinalCut, he was introduced to posting on YouTube. As he added Vine and Instagram to the mix, his exposure grew. Zach says that Vine exposure has brought him bigger clients, like Coca-Cola and McDonald’s, with bigger budgets. Listen to the show to discover why Zach believes platforms like Vine are changing the commercial branding world. Zach states that Vine is very secretive about their analytics. The only metrics available are likes, ReVines and the released loops. He shares that he estimates the average Vine user to be between 13 and 25 years of age—otherwise known as Millennials. He explains that Vine has a diverse collection of categories including a DIY category where you learn how to do a project in 7 seconds and a Comedy category, which Zach believes is the number-one reason people are on Vine. DIY is one of 12 categories or channels to choose from. Zach says you don’t need any film experience to be successful on Vine. He points out that a lot of Viners who have 7 or 8 million followers simply grabbed a camera and started recording. Listen to the show to hear how personality and style lead to follower growth. Zach shares you need the Vine app to view videos on Vine, but that they can also be embedded on websites. He says embedding is what led to Vine’s increased popularity and that Vines perform best outside of the app. Listen to the show to find out how a third-party YouTube compilation of Zach’s Vines contributed to his success. While it attracts bigger brands like Coca-Cola and Virgin Mobile, Zach explains that marketing on Vine is different than on platforms like Facebook because Vine hasn’t monetized. He says that because brands can’t pay to have their Vines put in front of someone, they’re served to Viners who fit into the business’s niche. Zach talks about how brands work with individual influencers on Vine. 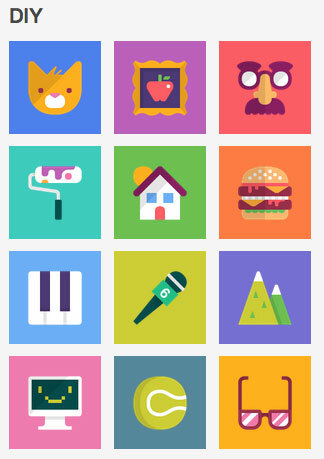 Zach suggests that before your business joins Vine, you should know if it’s a good fit. He says if you aren’t trying to reach the 13- to 25-year-old demographic, Vine may not be for you. He explains how Lowe’s uses DIY Vines and why he thinks there’s a big opportunity for other brands to use Vine to show a process. Listen to the show to hear Zach break down his story process. Zach says that while he’s been on YouTube for a while, he’s only recently joined Instagram after finding that people were duplicating his type of content for Instagram. He explains that if he’s got a Vine that does really well, he posts an extended 15-second version of the video on Instagram. Zach also posts video to Instagram. Zach uses YouTube in a similar fashion by posting much longer, behind-the-scenes footage of shooting the original Vine. Listen to the show to find out why Zach believes video builds stronger relationships with his viewers and how he sees people who emulate his style. Zach explains that he uses both the Vine app and a camera to create his Vines. He believes audio is very important when it comes to video, so he uses a Rode VideoMic to make sure he has good sound. A background in film helps him with lighting. He says if you’re filming outside, it’s important to turn into the sun so it can light your face. For inside shots, Zach suggests getting close to a light source and shining a lamp on your face. Listen to the show to hear tips for framing your Vine video. 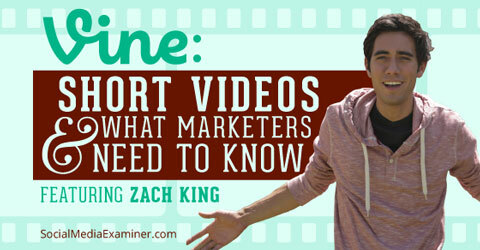 Find out how to use Vine short video for marketing. Do you work with a team of partners, employees or contractors? I recently came across an iOS app called the Personality Test by Andrew Helms. The app is based on the Myers & Briggs Personality Type Indicator and asks you a series of questions to place you into four categories; extroversion vs. introversion, intuition vs. sensing, feeling vs. thinking and judging vs. perceiving. 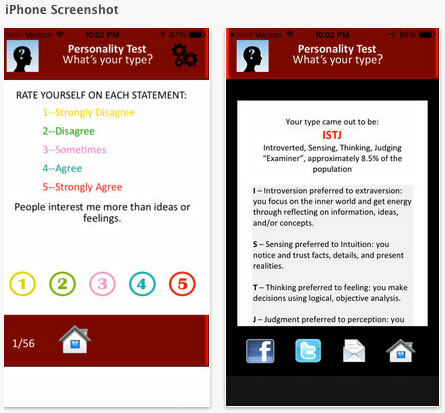 The Personality Test is available for iOS users. Extroverts get energy from interacting with people and introverts get energy by reflecting, thinking and being alone. Intuitives tend to trust in the future and theories while sensing people trust more in facts, details and present realities. If you’re a feeling person, you often make decisions that create harmony. However, if you’re a thinking person, your decisions are often based more on logic and objective analysis. A judging personality tends to make organized and orderly decisions quickly. If you’re a perceiver, you tend to be a little more adaptable and you keep your options open based on the realities of the circumstances. If you’re familiar with the test, I’m an ENTJ or an Extroverted Intuitive Thinking Judging personality. Once you take the test, it describes your personality traits, identifies potential careers, tells you what to avoid and shows you some famous people who share your traits. What’s cool about having your team take this test is that it helps you understand their strengths and weaknesses and how to work with that. Listen to the show to learn more about Mike’s personality. Take the test for yourself and share the results in the comments. If you’re looking for professional development, we have 45 sessions on LinkedIn, Google+, Twitter, Facebook, Pinterest and other networks to help you take your social media marketing skills to the next level. The entire event is online, so there’s no travel involved and each day has three sessions from social media professionals like Amy Schmittauer and Erik Fisher. Amy Schmittauer, founder of SavvySexySocial.com and president of Vlog Boss Studios, will be joined by Erik Fisher, social media manager for Social Media Examiner, to present How to Use Twitter to Build Relationships That Lead to Business. 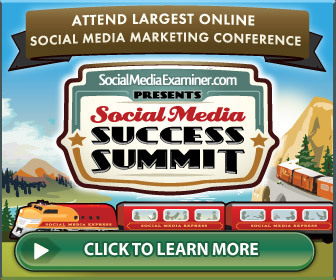 Amy and Erik are just two of the experts who will teach you how to improve your social media marketing and networking. If you want to learn more, visit here where you can check out all of the speakers and the agenda. Make sure you grab your ticket before the price goes up. Find more of Zach’s short-form video on Instagram. Watch Zach’s long-form video on YouTube. Learn how to shoot video at KingFilmSchool.com. Download Vine for iOS and Android. Read up on the Rode VideoMic. Take the Personality Test by Andrew Helms. What do you think? Are you interested in short-form video? What are your thoughts on how video can build a business? Please leave your comments below.